What's the most searched-for term or word on the internet? I want you to think about that, because it's not what you think, and it shows that many people have a fundamental misunderstanding of how search engines, and the internet itself, work. I want to make search work better for you, and that means finding what you're looking for. But before we get to that we need to understand what is, and is not a search engine. Based on what people are actually searching for, there's a lot of confusion. As I mentioned in a previous article, people are often confused as to what is and is not "search". But even when they know they're searching they often give up in frustration when they don't find what they want. Searching effectively is the key to unlocking the vast amount of information that's available to us on the internet. Unfortunately searching well can be a bit of mystical art. While advanced stuff you can do with most search engines like Google or Bing or others is pretty impressive, you don't need to be a "search engine jockey" to get better search results. I want to share the two mistakes I see people making most often. I'll also share my two-step approach to getting better search results. Steps that I'm convinced will get you what you're looking for well over 80% of the time (assuming what you're looking for exists, of course ). In a previous article I discussed my two-step approach to search: start broad, and then narrow your results. In this article I'm going to talk about a different approach, and remind you of an important search operator, to help you find sometimes the most precise and yet most obscure stuff on the internet. And it all starts with my wife and I watching TV. No, not the kitchen sink, but Everything Else!! It's almost like buying 4 books and getting 2 more for free! All digital formats and all bonus materials for all six books. Having been a "Road Warrior" for upwards of 20 years (Just stopped the travel), I would add 2 considerations for selecting a computer. First, especially for Laptops & Tablets, is Warranty. I swore off a national brand some years ago when a defect became apparent 2 weeks after warranty expiration and they refused to stand behind their product. I attained numerous analysis' of the situation, all of which agreed the defect was in design & manufacturing. For warranty, I can recommend Dell. I've had 2 claims with them, both of which were handled quickly. Second, if using a laptop, consider also the BAG you will use to carry it. Leo's remarks about screen size reminded me - I have a 17.1' screen on a Dell 1710 with 2 each 1 tb hard drives. It's a dream to work with, heavy to lug about. Enter a bag with extendable handle & wheels. Works like a complete portable office and tows effortlessly through airports & hotel lobbys. I own a small computer business and I am always trying to keep up with technology. Many of my customer are older (seniors over 65). I am experimenting with Chrome OS (using a Chromebox) and I think this has tremendous promise. You can buy a Windows laptop for what a Chromebook costs, but the setup, simplicity, stability, and safety of Chrome OS are unbeatable. I believe that Chrome OS may be all that 50% of us need. We may be a couple of years off from Chrome OS taking off seriously, but it is coming. There is a store in my area (BLH Computers in Springfield, IL) that sells USED PCs, laptops, etc. One can buy a PC that has been refurbished, cleaned up, hard disk wiped, and loaded with new operating system. They come preloaded with freebie software (e.g. OpenOffice). And they are cheap. The store will wipe it clean and reload the operating system for as long as you own it and the operating system is still supported. (I can't get XP loaded anymore). All I need is a backup of my data and any software I have added. I have to imagine that other cities have a similar store. (If not, why not?) Save your money, buy used. Most of us do not need the latest and greatest. 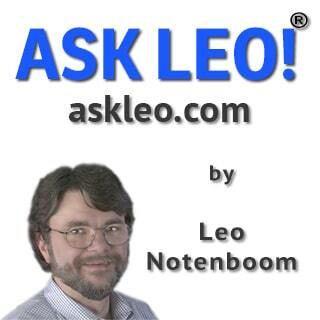 Leo, did you fill in a UserVoice comment on the crappy backup (or find one and +1 it)? The powers that be in Windows management are carefully looking at UserVoice feedback and prioritizing based on it (for example, my team recently created a new feature because it was the #1 requested feature on UserVoice). They really ARE listening. I did not, but I will now. :-) Problem is that since people interact so little with backup it's unlikely that it would get enough attention to get the attention that it deserves. This is one of those higher-level decisions that needs to be made not because people clamor for it, but because it's the right thing to do. I got a chance to download and install the technical preview of Windows 10 a couple of weeks ago. I was both pleased, and in at least one respect greatly disappointed. Given what I harp on all the time, you can probably guess what disappointed me: Windows 10 backup. Or rather, the lack thereof.